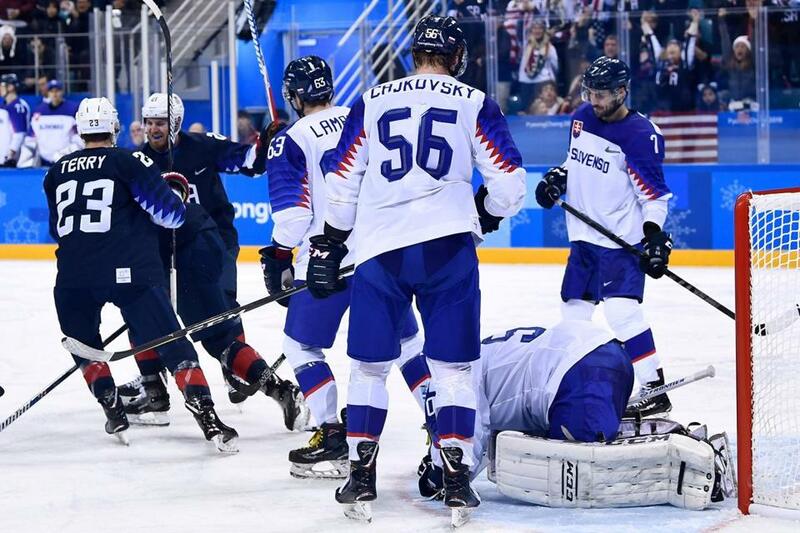 The US team celebrates a goal in the men&apos;s preliminary round ice hockey match between the US and Slovakia. GANGNEUNG, South Korea — Troy Terry grew up watching Pavel Datsyuk play for the Detroit Red Wings. Terry, a forward for the US men’s Olympic hockey team and the University of Denver, even got to see the 14-year NHL veteran play in person once when the Colorado Avalanche hosted the Wings. But Terry, 20, said he has to put that out of his mind and remind himself that he belongs in these Winter Olympics, the first Games without NHL talent in 24 years. Datsyuk, 39, is now an equal, and the competition as the US and the Olympic Athletes from Russia team face off Saturday in their final contest of group play before seeding is decided for the elimination tournament. “I think the more that we just kind of settle in and not make too big of a deal out of the game and just know that it’s another hockey game is the biggest thing for us,” Terry said after the Americans’ 2-1 victory over Slovakia on Friday, giving the US a 1-1 record and 4 points in the standings. The Olympic Athletes from Russia dominated Slovenia, 8-2, later Friday, giving OAR 3 points and tying them with Slovakia for second in the group standings behind the Americans. If the US beats OAR, in regulation or overtime, it will win the group and receive a bye into the quarterfinals. If OAR beats the US in regulation, it could have a shot at winning the group, pending the outcome of Slovakia-Slovenia. If OAR wins in overtime, it will tie the US in points with 5. If two teams are tied in points after group play concludes, the winner of the head-to-head matchup wins the group. If there is a three-way tie, however, this five-step tiebreaker is applied until there is no longer a tie. US coach Tony Granato and a handful of his players acknowledged that the OAR team will be coming in with extra motivation on Saturday after the Slovakians pulled out a 3-2 upset in OAR’s first game. After just five practices before their first game, the Americans have had to jell with each other fast and learn from their mistakes even quicker. They carried a 2-0 lead into the third period against Slovenia on Wednesday before allowing the Slovenians to tie it late and eventually pick up an overtime victory. The US simply did not keep its energy up for the entire game, forward Brian O’Neill said. Not the case on Friday against Slovakia. “I think we just knew that we let off the gas there [in the first game] and were very conscious about that, so in the third period [against Slovakia] we made sure that we kept the shifts short, especially in the beginning of the period so we didn’t run out of energy,” said O’Neill. The Americans also found success with their power play on Friday with Harvard’s Ryan Donato scoring both of the team’s goals on the advantage. O’Neill said special teams are always important, but especially in this tournament, and goalie Ryan Zapolski said he has been impressed with what he has seen so far. O’Neill said he would like to see his team clean up around the net after getting 31 chances on goal against Slovakia but converting only two. But as the Americans have begun to find their groove, they have started to use their identity: speed and quickness. OAR boasts size and strength. But Terry said if the Americans can turn the game into a track meet, it could cause some problems for OAR. “They may be bigger, but I think we have a really fast team here,” said Terry, who assisted on Donato’s first goal Friday. Rachel G. Bowers can be reached at rachel.bowers@globe.com.